Glutex™ is the well-known DOW brand for Glutaraldehyde, an effective broad spectrum biocide. STALDREN® is an effective, dry disinfecting Danish product, which has been tested by recognised international laboratories as a hygienic disinfectant. This hygiene remedy is available in a powder form, which has a broad effect on dampness, smell, as well as bacterial and fungal spores. Tylosin is a macrolide bacteriostatic antibiotic. The antibacterial spectrum of tylosin is mainly Gram-positive. 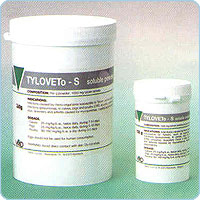 Tylosin is active in vitro against Mycoplasma spp isolated from fowls and against several species of spirochaetes including leptospria. 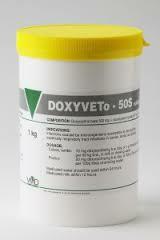 Doxycycline is a broad spectrum antibiotic belonging to the group of tetracyclines. It has a bacteriostatic action againt both Gram-positive and Gram-negative bacteria. It acts by binding to the bacterial ribosome which leads to an inhibition of the protein synthesis. Mold-Nil® animal feed additive is a blend of organic acids and phytochemicals, selected for their effectiveness against molds in grains. The formulation has a minimized amount of free propionic acid, a reduced amount of total propionic acid and a maximized amount of buffered propionic acid. Mold-Nil® Pro is designed to be less corrosive to machinery and effective against a broad spectrum of molds in grains to protect nutrients and extend shelf life. Unike® Plus is a mycotoxin binder that provides maximum protection not only against ingested mycotoxins, but also against the negative effects of absorbed mycotoxins. Adsorbate® a competitive clay bentonite to assist in absorbing toxins. Salmo-Nil® is a spray-dried mixture of salts of organic acids and their free acids. It has been formulated for the control of harmful microorganism in the feed with special function against Salmonella. Toxy-Nil® is a reliable, cost effective solution to inactivate mycotoxins (in particular more polar mycotoxins) and minimise negative effects of mycotoxins on animal productivity. Is a prebiotic additive rich in β-Glucans and mannanoligosaccharides (MOS), derived from the Saccharomyces cerevisiae yeast cell wall. It prevents colonization of the intestinal tract by pathogens, stimulates the immune activity of the phagocytic cells, enhances the action of beneficial bacteria such as Lactobacillus and Bifidobacteria, making an immunological wall against diseases. The benefits include increased feed efficiency, growth rate while reducing mortality. StarYeast® is a natural fermentation product made of 100% Saccharomyces cerevisiae cells which is a rich source of protein, soluble fiber and some minerals. In addition to high palatability, StarYeast® present an excellent nutritional profile, with a high concentration of vitamins of B complex. A combination of well-balanced essential vitamins combined with and amino acids to support growth and compensate for periods of heavy labour such as gestation, laying eggs and excercise.